An easy appetizer dip in your slow cooker! 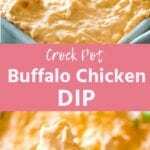 This creamy Crock-Pot Buffalo Chicken Dip is everyone’s favorite dip for parties! 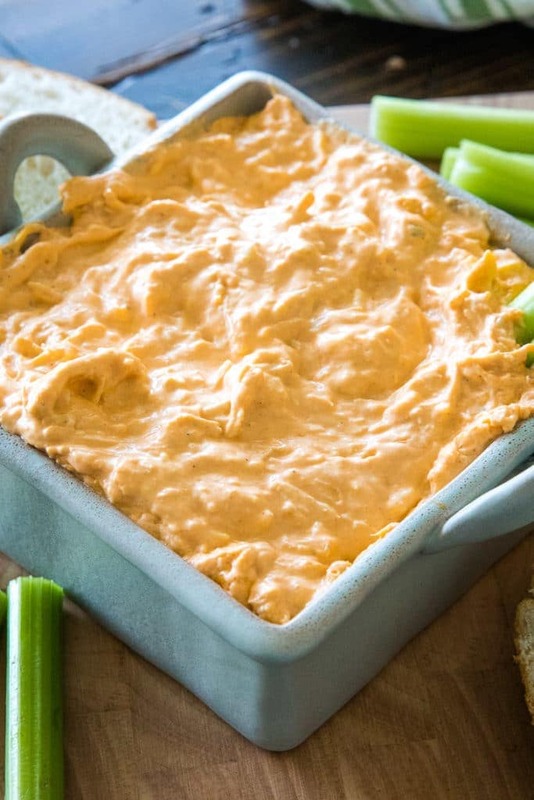 This dip recipe is full of chicken, ranch, buffalo sauce, cream cheese and shredded cheese. It’s the best game day appetizer recipe! It’s football season! Who’s planning their weekend around what games they are going to watch? Not me, but I am planning it around what football food I’m going to eat! 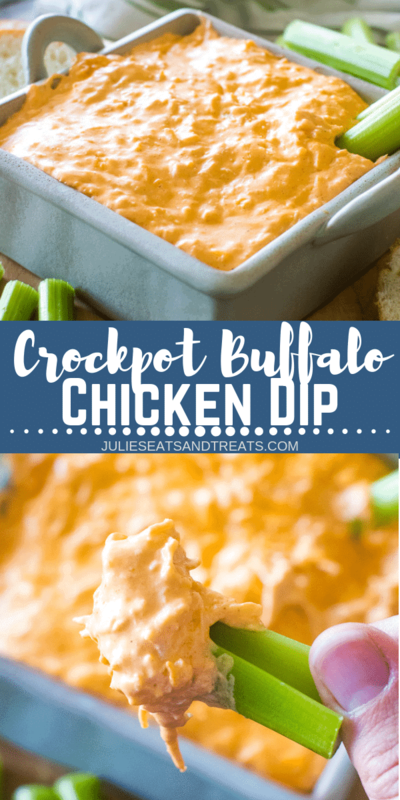 You can bet this delicious Crock-Pot Buffalo Chicken Dip is on my short list. It’s so easy, creamy and always a hit at every party I bring it to. I also love the fact I can throw it in my slow cooker on Sunday morning before we run out the door to church. I mean, literally run out the door because I have three little children and it’s always a dash in the morning! This dip, I can totally pull off though even when I’m crunched on time because I literally throw it in my slow cooker, stir it and let it do its thing. Then I get to come home to an amazing Crock-Pot full of Buffalo Chicken Dip after church and I feel like I have it all together! Or if we are going to a party I can grab it and run out the door again. I feel like I do a lot of running around in my life right now! Another one of my favorites is this Cheesy Corn Dip Recipe or how about Beer Dip Recipe. I mean it has beer in it! Enough said! You know what else I deal with in my life? It’s such a bummer and always hits at the worst time it seems. For example, when I’m at a friend’s house watching the game and enjoying this Buffalo Chicken Dip. It’s totally miserable and I’m left either going home, suffering through it on the couch and not participating in the festivities like I want to, or faking that I feel great! All of those are not fun options. That’s why I love new Equate Omeprazole Orally Disintegrating Tablets! Another thing I love is that it’s an easy-to-take disintegrating tablet, so no matter where I am, I can pop it in my mouth and it dissolves on my tongue without water, which is great because we know I don’t have a lot of extra time in my life right now. Plus, it’s strawberry-flavored so it even tastes good! One dose every 24 hours for 14 days is all you need to finish the treatment. Don’t take Omeprazole ODT for more than 14 days unless directed by your doctor. 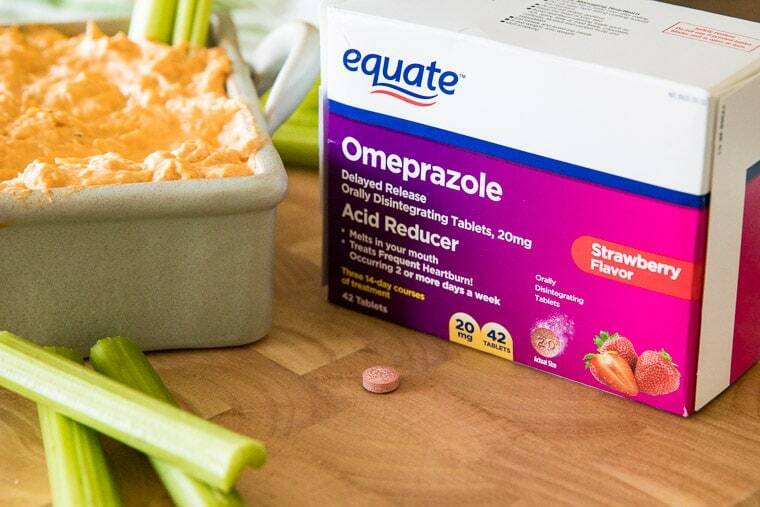 Equate Omeprazole ODT is designed to treat frequent heartburn (meaning you suffer from symptoms 2 or more days per week). It’s now available at Walmart which is awesome because it’s convenient when I’m grabbing groceries and supplies for the big game, plus it’s affordable! 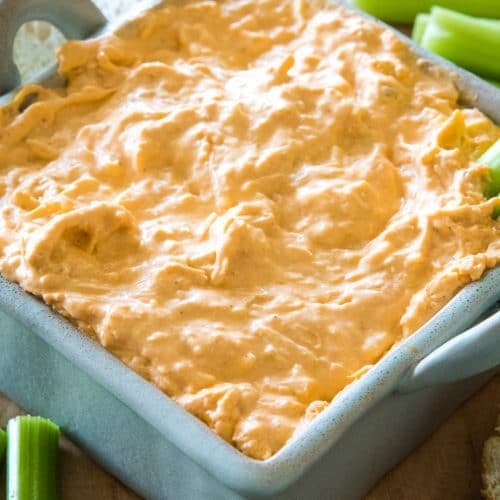 What ingredients do I need to make Buffalo Chicken Dip? How do you make Buffalo Chicken Dip? In a small Crock-Pot mix together all ingredients. Stir well to combine. Cook on low for 2 hours, stirring a few times while cooking if you can to mix up the cream cheese. Serve with your favorite dippers like celery stick, crackers, pretzels, bread slicers etc! Quick tips for making Buffalo Chicken dip! If you don’t have any cooked, shredded chicken on hand simply substitute that with 2 cans of chunk chicken that has been drained. I love having Crock-Pot shredded chicken in my freezer so I can make this dip any time I want! If you prefer blue cheese with your hot sauce instead of ranch simply substitute a blue cheese dressing for the ranch in this recipe! I prefer Colby-Jack cheese for this recipe, but in a pinch any shredded cheese will do! Remember it’s best to use a block of cheese and shred it yourself because it will melt much better than the preshredded cheese! If you want to kick this Crock-Pot buffalo chicken dip up a notch add some more of the hot sauce. I started with a 1/2 c. but feel free to adjust depending on your taste preference. You can add buffalo sauce after it cooks if you want to adjust the level of spice. 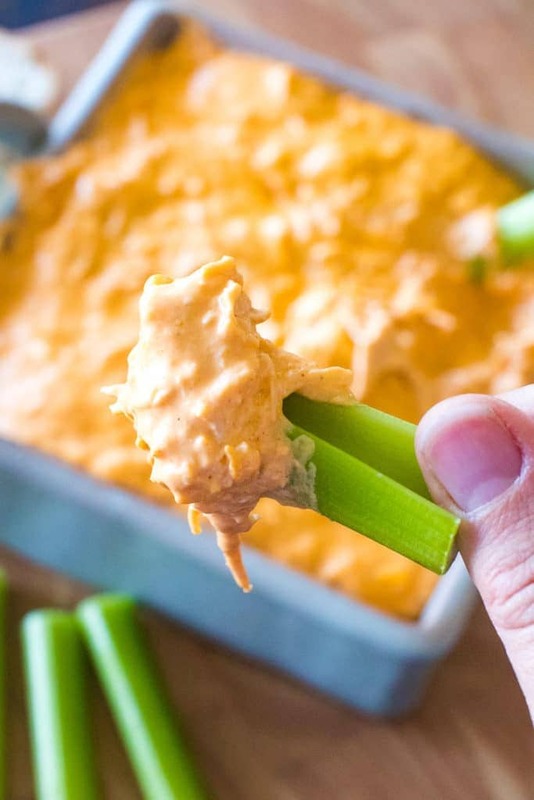 Anything you can dip goes with this buffalo chicken dip! My favorites are slices of bread (hearty to hold a lot of dip! ), pretzels, tortilla chips, crackers and celery. Really, the sky is the limit. If you have leftovers stuffed inside a grilled cheese sandwich! 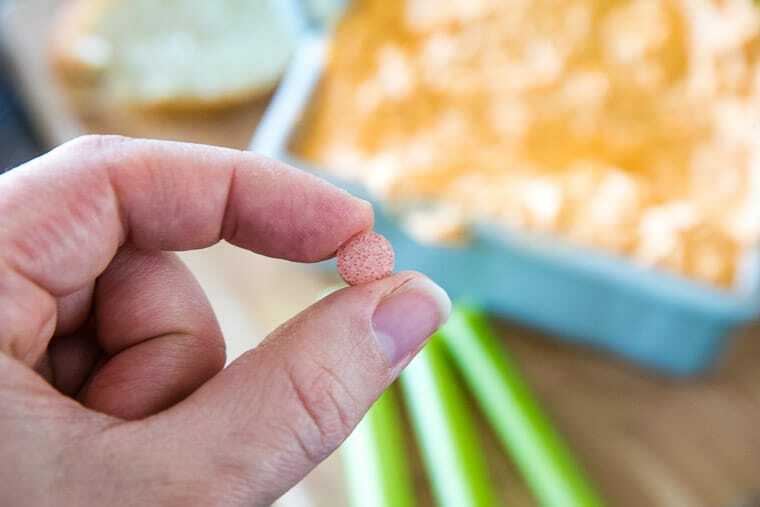 Can I make Buffalo Chicken Dip in the oven? You can make this in the oven by spreading the cream cheese on the bottom of a 1 quart baking dish. Layering the chicken, hot sauce, dressing and sprinkling with shredded cheese. Bake at 350 degrees F for 20-25 minutes or until cheese is melted. 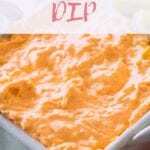 Here’s a great oven baked Buffalo Chicken Dip! An easy appetizer dip in your slow cooker! 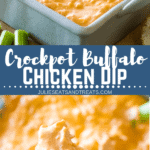 This creamy Crock-Pot Buffalo Chicken Dip is everyone's favorite dip for parties! This dip recipe is full of chicken, ranch, buffalo sauce, cream cheese and shredded cheese. It's the best game day appetizer recipe! You can substitute the cooked chicken for 2 (9.75 oz) cans of chunk chicken that has been drained. You can make this in the oven by spreading the cream cheese on the bottom of a 1 quart baking dish. Layering the chicken, hot sauce, dressing and sprinkling with shredded cheese. Bake at 350 degrees F for 20-25 minutes or until cheese is melted. Oh yesssss this is happening all football season long! Such a great party dip and everyone always goes nuts for it! This dip looks absolutely amazing and so delicious! It’s always a hit at any party! Oh man, does Equate also have dissolving pain reliever tablets? Like ibuprofen? I’ve got kids who can’t swallow pills, so that would be amazing! That would be an amazing thing! Great addition to party appetizers! Yum! Can’t go wrong with this staple at any party! My husband deals with heartburn sometimes so I will remember these next time at the store! And this dip will be perfect for game day!! Yes you need to have him try them! Enjoy the dip! Made this for Monday Night Football – it was perfect to nosh on during the game. Five stars from me!!! Can’t go wrong with a dip for football season! This is a favorite for us on game day! I can’t resist this dip! So addicting!